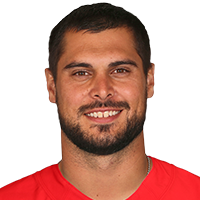 Published: Nov. 26, 2017 at 03:50 p.m.
Miami Dolphins quarterback Matt Moore connects with running back Kenyan Drake for the touchdown. Published: Nov. 19, 2017 at 04:23 p.m.
Miami dolphins quarterback Matt Moore launches a bomb to wide receiver Kenny Stills for a 61-yard touchdown. Published: Nov. 19, 2017 at 03:22 p.m.
Miami Dolphins quarterback Matt Moore throws a bomb to wide receiver Kenny Stills for 45 yards. Published: Nov. 19, 2017 at 03:04 p.m.
Miami Dolphins quarterback Matt Moore throws to wide receiver Jarvis Landry who runs 49 yards for a huge gain.